The twin islands of Trinidad and Tobago have plenty to offer visitors both on private yachts or those enjoying luxury yacht charters in the Caribbean. While Trinidad is primarily thought of as a hurricane bolt hole, rather than a yachting destination, it does still offer wonderful wildlife and hiking opportunities. Trinidad also has a reputation as one of the best Caribbean islands to party on thanks to its annual carnival, which takes place on the Monday and Tuesday before Ash Wednesday. In contrast, its neighbour Tobago is the perfect destination to explore by luxury yacht thanks to its hidden bays, secluded reefs and beautiful beaches. This week long itinerary allows you to enjoy the best of both islands at a leisurely Caribbean pace. With your yacht safely tucked up in the CrewsInn Marina, take the opportunity to explore the rain forests of the northern mountains with an experienced local guide. Trinidad is a birdwatchers paradise with colourful and exotic species from the South American mainland. There are a wide variety of hiking trails, from the very easy to the extremely demanding, so no matter how fit you are, you will enjoy exploring the waterfalls, caves and rainforest. After a few hours you will raise the coast of Tobago, and undergo custom formalities in Scarborough — perhaps use this as a chance to go ashore and discover Tobago's main town; it has some shops and the historic Fort King George, now a museum. 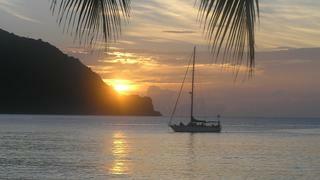 Leaving the rougher Atlantic side of the island behind, you will head just round to the Caribbean side and Store Bay. This is the perfect base to take a tender ride round to Pigeon Point and the lovely Buccoo reef for some wonderful snorkelling. This is a protected marine park and is one of the most accessible reefs in the Caribbean. Store Bay itself has one of the island's most popular public beaches, overlooked by the low-key Store Bay Holiday Resort. To avoid the crowds visit the beach at Pigeon Point, which is one of the best beaches in the Caribbean. You will be charged a modest fee to enter but it has one of the best sunset views in the Caribbean. After a few hours you will raise the coast of Tobago, and undergo custom formalities in Scarborough — perhaps use this as a chance to go ashore and discover Tobago's main town; it has some shops and the historic Fort King George, now a museum. 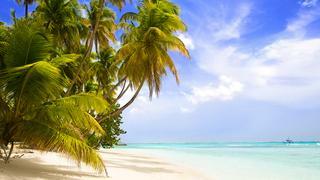 Leaving the rougher Atlantic side of the island behind, you will head just round to the Caribbean side and Store Bay. This is the perfect base to take a tender ride round to Pigeon Point and the lovely Buccoo reef for some wonderful snorkelling. This is a protected marine park and is one of the most accessible reefs in the Caribbean. Store Bay itself has one of the island's most popular public beaches, overlooked by the low-key Store Bay Holiday Resort. To avoid the crowds visit the beach at Pigeon Point, which is one of the best beaches in the Caribbean. You will be charged a modest fee to enter but it has one of the best sunset views in the Caribbean. A short hop will bring you to Mount Irvine Bay. The beach here is OK, but can be busy. The best plan is to use this bay as your base (it's a secure anchorage) and explore on land and by tender. If you are fond of wildlife, stop off at the mangrove-fringed Bon Accord Lagoon, only accessible from the sea and see what birds and animals you can spot. Golfers can take a detour via the Mount Irvine Golf Course, near Grange Beach, which is one of the best golf courses in the Caribbean with stunning sea views North of Mt Irvine Bay is Stone Haven Bay, with snorkelling to the calmer North end, the bay has powerful waves an currents.  The primary attraction is on shore and the Le Grand Courlan Spa Resort. This 4-star hotel has the best spa facilities on Tobago. A short hop will bring you to Mount Irvine Bay. The beach here is OK, but can be busy. The best plan is to use this bay as your base (it's a secure anchorage) and explore on land and by tender. North of Mt Irvine Bay is Stone Haven Bay, with snorkelling to the calmer North end, the bay has powerful waves an currents.  The primary attraction is on shore and the Le Grand Courlan Spa Resort. This 4-star hotel has the best spa facilities on Tobago. Continue to head northeast along the Caribbean coast towards Cotton Bay (aka Celery Bay). If your visit corresponds with turtle nesting season (March-August) you may be able to stop off at Turtle Beach, within Great Courland Bay, and watch the huge leatherbacks come in to lay their precious eggs. Otherwise stop of for a morning swim in Arnos Vale Bay and reputedly the best snorkelling on the island. Head to Castara Bay for lunch, and to while away the afternoon. There are two golden sand beaches here and good snorkelling. If you are lucky you may get to swim with manta rays. Ashore you can easily hike up into the hills to enjoy some spectacular views and cool off in forest waterfalls. You can watch the sunset over the Caribbean, but will probably return to Cotton Bay (aka Celery bay) for a restful night. Continue to head northeast along the Caribbean coast towards Cotton Bay (aka Celery Bay). 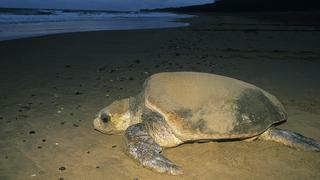 If your visit corresponds with turtle nesting season (March-August) you may be able to stop off at Turtle Beach, within Great Courland Bay, and watch the huge leatherbacks come in to lay their precious eggs. 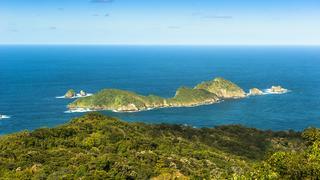 Otherwise stop of for a morning swim in Arnos Vale Bay and reputedly the best snorkelling on the island. Head to Castara Bay for lunch, and to while away the afternoon. There are two golden sand beaches here and good snorkelling. If you are lucky you may get to swim with manta rays. Ashore you can easily hike up into the hills to enjoy some spectacular views and cool off in forest waterfalls. You can watch the sunset over the Caribbean, but will probably return to Cotton Bay (aka Celery bay) for a restful night. Spend the morning in Englishman's Bay  The rainforest comes right down to the lovely beach where the sand is powdery and pale and snorkelling is good around the deep sheltered bay. 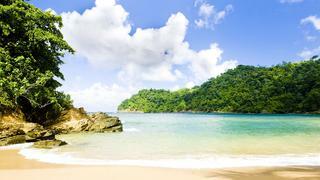 For a taste of the authentic, rural Tobago, nearby Parlatuvier Bay is home to a tiny fishing village of the same name. There is little ashore except some local snack shacks, but this is a genuine flavour of the Caribbean. Finally, you will settle in Bloody Bay. The beauty of this place belies its gruesome name (said to originate from an historic battle that turned the sea red). This sheltered bay has clear water and golden sand, and is often deserted except for the odd fisherman. Spend the morning in Englishman's Bay  The rainforest comes right down to the lovely beach where the sand is powdery and pale and snorkelling is good around the deep sheltered bay. 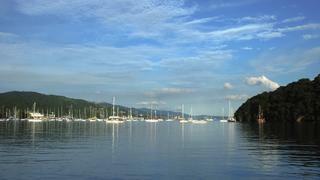 For a taste of the authentic, rural Tobago, nearby Parlatuvier Bay is home to a tiny fishing village of the same name. There is little ashore except some local snack shacks, but this is a genuine flavour of the Caribbean. Finally, you will settle in Bloody Bay. The beauty of this place belies its gruesome name (said to originate from an historic battle that turned the sea red). This sheltered bay has clear water and golden sand, and is often deserted except for the odd fisherman. Lovers Bay is a small, gorgeous bay with multi-coloured sand and excellent snorkelling, Dead Man's Bay and Waterfall Bay are both remote and secluded. Finish your day in Pirates Bay where marauding buccaneers used to shelter 300 years ago.